Luck’s started as Mountain View Canning Company in Seagrove, North Carolina in 1947. It was founded by Alfred Spencer and Ivey Luck, with a third partner Clay Presnell joining in 1948. Mountain View Canning Company’s first products included Mountain View Beef and Mountain View Sausage, until the items were replaced by Pinto Beans, Great Northern Beans and Blackeye Peas, all seasoned with Pork. The brand and company name was changed to Luck’s Inc. in 1953 and the beans were packed in the classic yellow labels. In the early 1950’s, Luck’s sponsored the country band Tommy Floyd and the Blue Ridge Buddies, who hosted a live radio broadcast on Saturday mornings. After trying Luck’s Pinto Beans, Tommy Floyd and his band were soon promoting them with a series of short musical spots syndicated on television stations in the Southeast. The song went, “Luck’s pinto beans. Luck’s pinto beans. Eat ’em and you’ll never go wrong. 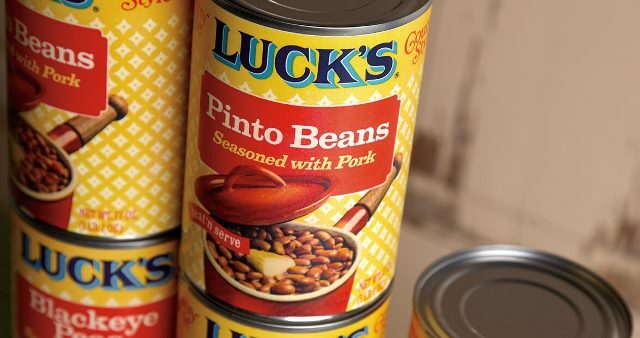 Luck’s pinto beans.” These promotions helped Luck’s Beans become a household name. 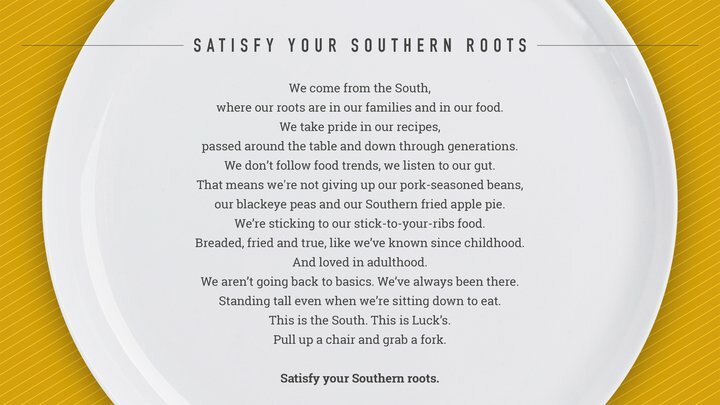 Over the next few decades, Luck’s produced more than 40 different products, including Salad Greens (Seasoned with Pork); Turnip Greens with Diced Turnips (Seasoned with Pork); Chicken and Dumplings; Fried Chicken with Gravy; Potatoes and Beef in Gravy; and Luck’s Bar-B-Q. In 1967, Luck’s merged with American Home Products. Then in 2000, Luck’s was acquired by Con Agra. In 2011, the Luck’s brand was purchased by Arizona Canning Company, which later merged with Minnesota-based company Faribault Foods. Today, Luck’s offers a wide array of premium quality Beans, Chicken and Dumplings, Fried Apples and Fried Peaches, delivering the authentic Southern flavor that made them famous.